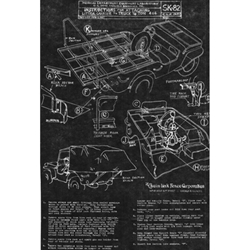 Chain LInk Corporation WWII Jeep Ambulance Conversion Kit. Kit, ambulance conversion (WWII vintage) includes all metal parts needed but no canvas. These kits are NOS so may have some light surface rust. This is an extremely rare kit for a WWII jeep. The canvas can be sourced from Beachwood Canvas. NOTE: We have now produced the special spare tire bracket so it is included in the kit. NOTE: Kit will ship Motor Freight.